Your chin determines how you look in your profile! 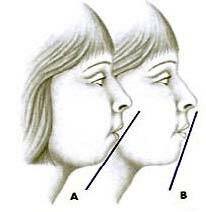 The chin is a very important facial feature, since it gives a definitive shape to face. A weak or receding chin makes a normal nose appear large and an already prominent nose seems even larger. It may also give the appearance of a 'fleshy' neck. On the other hand, a too prominent chin may give the appearance of having too small of a nose or otherwise throwing the face off balance. Chin Implant is the surgical use of implants to bring the chin into better balance with your other facial features. 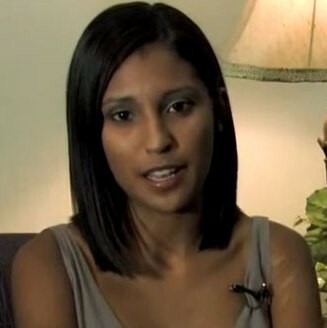 It is very common to have chin implants when a nose job (rhinoplasty) is being done. 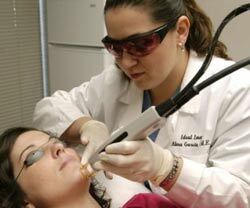 Physicians also refer to the procedure as Genioplasty. The outcome is a balanced relationship between the structures of the face. What is Chin Implant Surgery? Chin Implant Surgery, also known as mentoplasty, is a surgical procedure to reshape the chin either by enhancement with an implant or reduction surgery on the bone. Many times a plastic surgeon may recommend chin surgery to a patient having nose surgery in order to achieve facial proportion, as the size of the chin may magnify or minimize the perceived size of the nose. Chin surgery helps provide a harmonious balance to your facial features so that you feel better about the way you look. The chin is considered to be one of the main balancing points of the face along with the cheek width, forehead height and nose shape. The main purpose of having a chin implant (also known as a mentoplasty) is to restore a sense of balance and symmetry to a face that might appear crooked as the result of a recessed, protruding or absent chin. Sometimes chin implants are recommended along with a nose plastic surgery in order to harmonize the different elements of the entire face. Are you a Candidate for Chin Implant Surgery? As with any type of major plastic surgery, you will not be considered to be a good candidate for a chin implant if you have a history of psychological instability or are suffering from an autoimmune disorder. You may also be encouraged to quit smoking before having this operation, as it requires a small incision inside the mouth. You may not be a candidate for this dental problems in your lower jaw Surgery Indiatype of operation if you suffer from extreme gum disease or dental problems in your lower jaw. Also this type of operation succeeds the most in individuals who have a normal dental bite. As a chin implant can drastically change your appearance it is very important that you spend as much consultation time as possible with the plastic surgeon who is to do the operation so that both of you are satisfied that the look you want can be achieved. Sometimes it helps to bring photographs of individuals who have similar facial features as yours but who also have type of chin you desire to these consultations. How to Prepare for Chin Implant Surgery? What you should and shouldn’t be eating. Which medicines can and can’t be taken, for example aspirin or anti-inflammatory. The length of time you ought to take off work, generally this is about a week. What to prepare for when you return home, for example bandages, painkillers and icepacks. By keeping to your surgeons advise you will be preparing your body for the upheaval it is about to undertake. Staying as healthy as possible and providing your body with the right nutrients will help it to repair itself faster post-surgery. Likewise, keeping toxics out will also ensure a quicker recovery time. What are the Types of Chin Implant Surgery? There may be surgeons who only wish to use a certain implant type or a certain incision. Surgeons would give you a choice. As the updated techniques is less scarring than the previous ones. The doctor may school an oral approach where the only incisions are placed within the mouth area. No visible scar is made and the oral incisions heal much faster. However, oral techniques sometimes are plagued by a higher rate of infection. Genioplasty: it is a way for improving the weak chin and the process involves removal of a section of the jaw with an oscillating bone saw. The bone is thereafter kept in the place with the metal screws and plates providing a complete improved look to the patient. Chin Reduction Surgery: this cosmetic chin surgery is performed with incisions in the chin and sculpting the bone while the excess of fat is removed from it. Double Chin Plastic Surgery: during the process of the double chin plastic surgery the excess skin and fatty tissues which causes double chin are removed. The Tumescent Liposuction is another treatment for removing the excess fat from the chin through a small incision. How is Chin Implant Surgery performed? Chin Implant Surgery also called Meatoplasty. The operation aimed to shape the chin by making it smaller or bigger. Most chin implant procedures are performed on an outpatient basis. The surgery can be performed in a dedicated surgery center, a hospital, or in a surgery suite at your plastic surgeon's office. A larger chin can be created by an implant insertion or by surgery, which elongates the lower jaw. Smaller chin is made by reducing the size of the lower jaw. In many cases the surgeon will recommend Meatoplasty for patients undergoing nose surgery in order to fit the new nose to the face, creating more harmonic appearance. When looked from the side the nose size should fit the chin. The implant insertion may last from 30 minutes to one hour. The surgeon will design the implant that fits your chin and then inserted it to a "pocket" located in front of the chin. A small cut for the insertion can be made inside the mouse near the lower lip or from the outside just below the chin. After the procedure the chin is bandaged using plasters to prevent swelling and implant movement. Bandages also help prevent uncomfortable felling. The stitches can be removed after 5-7 days. In case the cut is made inside the mouse melting stitches are used and there is no need to remove them. The surgery can be done using local anesthetics with sedative drugs and sometimes with general anesthesia. Every operation has its risks. The implant may move from the original place. Then you need to undergo additional procedure to replace it. After surgery, the chin is typically taped after to provide support and to minimize swelling and discomfort. If the implant was inserted through your mouth, dissolving stitches will probably be used. They will dissolve in about 10 days. 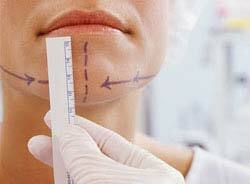 If the incision was made in your chin, regular stitches will be used. Those will be removed during a follow-up visit to your plastic surgeon's office, about a week after your chin surgery. After surgery, you will be taken to a recovery room and monitored until you are discharged to go home. You will need a ride home, and you may want to arrange to have someone look after you for a day or two after your surgery. What to expect after Chin Implant Surgery? Enhancing one's chin with an implant is a common plastic surgery procedure. The simple placement of a synthetic implant on the front of the chin (mandibular symphysis) bone can make a dramatic difference in how the lower jaw looks and in the appearance of the lower face and neck. While chin implant is a very straightforward operation, there are some common side effects that will occur after surgery which will go away with time. Despite the fact that a chin implant and the incision through which it is placed are small, it will definitely make the chin sore after surgery. This is because it is necessary to lift the chin muscle (mentalis) off of the bone to position the implant in place. The soreness will go away in a week or so as the muscle pain settles down but the chin will feel stiff for awhile. One may also notice some unusual muscle movements or 'spasms' as the chin muscle heals over the implant. This is the result of the muscle adapting to being stretched over the size of the implant. How is the Recovery after Chin Implant Surgery? After your Chin Implant Surgery, you will need to have someone drive you home. You plastic surgeon's office should give you detailed instructions on your post-operative care. 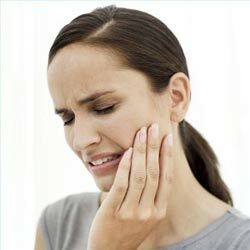 Expect to experience some discomfort and swelling in the chin and jaw area for several days of your procedure. You will likely have some difficulty with smiling and talking. This is only temporary and you should feel better in a few days. You may have some bruising around your chin and your neck. Your plastic surgeon's office will give you instructions on brushing your teeth and rinsing your mouth in such a way as to avoid irritating the area. While recovering from chin surgery is quick compared to other types of facial cosmetic surgery procedures, there will be some restrictions on your activities for a short period after your surgery. Normally, most bruising and swelling should be better in a few days. If the chin implant was placed using an incision in your mouth, there will probably be restrictions on the types of foods that you can eat for a few days. Soft foods, such as Jell-o or pudding may be recommended. You may also be instructed to drink meal-replacement shakes so you can meet your nutritional requirements without the need for vigorous chewing. Ice packs or cold packs: They stay cold a long time, don't leak when they melt, and conform to the shape of your face. A thermometer, so you can take your temperature if you suspect a fever. Gauze rolls to absorb any discharge or bleeding. What are the Benefits of Chin Implant Surgery? What are the Risks of Chin Implant Surgery? Significant complications from chin implants are infrequent. As with any surgical procedure, however, there is always a possibility of infection, or reaction to the anesthesia. What are the Alternatives to Chin Implant Surgery? There are other options aside from chin implants, it would be worthwhile to look into these and assess the pros and cons of all the options available to you. For example orthodontics, fat re-sculpting or injected fillers can produce similar results to chin implants and might be less invasive or extreme. Generally speaking chin implant is a good long-term permanent solution to a receding chin and will give you the best lasting effects. The surgeon may discuss alternative approaches to the chin implant procedure. Liposuction of the neck and chin may remove enough excess fat to redefine the chin or neckline. Orthodontics can treat misaligned teeth which are often the root cause of a recessed jaw. Why Chin Implant Surgery in India? Chin Implant Surgery in India happens to be the most cost savings and high quality solution for global patients looking for cosmetic change. The advance Indian cosmetic clinics and medical centres are well equipped with ultra modern equipments and have excellent standards of hygiene and dedicated consultants and renowned cosmetic surgeons with massive experience in dealing both India and abroad. Chin Implant Surgery in India comes with advanced cosmetic protocols and is delivered using modern facilities, sterile techniques and products meeting international standards which are designed for comfort and efficiency as evident in developed nations through expert cosmetic care to foreign patients. I was very cautious about choosing the right surgeon when I had to get my chin implant. I was very impressed by the doctors at Tour2India4Health. They listened to all my questions patiently and explained the entire procedure to me. In every consultation prior and post the surgery, they were really patient to listen each and everything I had to say and were transparent about explaining my condition. It’s only because of them that I am much more confident about my looks now as the shape of my chin is perfect, making me not just beautiful but also more beautiful. What is the Cost of Chin Implant Surgery in India? Cost advantage is a major selling point for Chin Implant Surgery in India. This difference goes huge, the global patients can only require a tenth and sometimes even a sixteenth of the cost in the developed nations. Thus this plays a pivotal role in bringing a huge crowd of foreign patients all across the world to India. The following figure indicates the cost of certain treatments in US and India, which can give you a fair idea of the cost difference. Mumbai - Mumbai, formerly known as Bombay in English, is the capital of the Indian state of Maharashtra. This port city (India's largest and busiest) accounts for a major share of the government's revenue, and has one of the world's largest harbour. There are many things to love about Mumbai. One is simply the geographical names, like The Queen's Necklace and Elephanta Island, all with roots in the British Empire. Hyderabad - Also known as City of Nizams. The city of Hyderabad has its own individual character, which is evident in the beautiful, ancient palaces and the equally modern, and state-of-the-art offices and buildings. Medical tourism at hospitals in Hyderabad combines care for your health with international tourism. The primary reason behind its surging popularity is better healthcare services at an affordable budget. Goa - Popularly known as the ‘Rome of the East’, Goa boost of natural, magnificent churches and exquisite works of man. Plunge into the clear blue water of the large pool, or soak in the blissful sunshine on the picturesque island. Goa is an interesting location for getting your health propped up and getting those long postponed surgeries done. You have modern facilities, short waiting times and very affordable prices for procedures, hospital services and medicines. Bangalore - The progressive and modern city of Bangalore is the state capital, being located within India's Karnataka state. Bangalore is often referred to as the country 'Garden City', due to its high concentration of parks and green spaces. Bangalore has few of the world’s best doctors and medical practitioners, who have been trained by the rigorous Indian medical education system as well as in countries like UK and USA. Nagpur - Nagpur City has many distinctions. It is also the second greenest in India and is located at the very center of the heartland, almost equidistant from Kolkata, Chennai and New Delhi and Mumbai. The present city was founded in the early 18th century by Bhakt Buland, a Gond prince of the kingdom of Deogad in the Chhindwara district. The Nagpur District has a varied culture, as well as being in the central part of India, the market in Nagpur is flooded with products from all over India. Nagpur has few of the world’s best doctors and medical practitioners, who have been trained in countries like UK and USA. Kerala - Natural beauty, clean air and primordial greenery amidst the vast expanse of water and sky, typifies the state of Kerala – better known as God's own country. Kerala is famous for its alternative medical therapies such as Ayurveda, which help to rejuvenate and revitalize the body. The region is also home to India’s only virgin tropical rain forest – the Silent Valley National Park, supporting an overwhelming range of life forms, many of which are highly endangered, and endemic to this part of the planet. Delhi - "Welcome to The Capital City of India - New Delhi" Delhi is famous as Capital city of India is located in North India. Delhi is truly a symbol of the old and the new; a blend of ancient well preserved monuments and temples along with jam-packed burger joints and up market shopping malls. Delhi has state of the art Hospitals and the best qualified doctors. Pune - Once referred to as the Oxford of the east, Pune continues to be a stronghold for academics and culture. An array of factors like availability of efficient and experienced doctors, comparatively low treatment costs, hospital facilities of international standards and many more have made Pune one of the top destinations for medical tourism. Jaipur - Jaipur is one of the most popular destinations on a tourist's itinerary. The magnificent forts, beautiful havelis and colourful bazaars make Jaipur a popular tourist destination among tourists. Jaipur has pioneered health and medical tourism in India. Chennai - Chennai is one of the most developed urban centers in the Indian subcontinent. The city forms the capital of Tamil Nadu state and is the fourth largest metropolitan city in India. They have some of the very best hospitals and treatment centers in the world. Each hospital is equipped with state of the art facilities. The technology brought into practice is the very latest, including robotic surgery. Gurgaon - Located in the National Capital Region, Gurgaon is one of the most rapidly growing cities in Greater Delhi. In the last few years Gurgaon has boomed as the hub of IT and other new-age businesses. Gurgoan is the latest destination for Medical Tourism in India as it is the latest modern upcoming city near Delhi. Chandigarh - Located near the foothills of Shivalik range of the Himalayas, Chandigarh is one of the most beautiful and happening cities of India. Chandigarh has great potential for Medical tourism as the unpolluted and excellent environs give many opportunities to patients to recover from their illness.